Once you discover the amazing comfort and aesthetic value of our stylish outdoor bean bags, you’ll want to keep them looking their best for life. Fortunately, because they are made to withstand weather, moisture and temperature extremes, keeping them looking clean and new is easy. Unlike other types of outdoor furniture, your bean bags won’t require treatment with special products or elaborate storage preparations. A little preventative maintenance and light cleaning is all they need. Here are our top five cleaning tips to help you keep your beautiful bean bags looking great year after year. When you’re not using your bean bag outside, bring it indoors. Storing it inside protects it from acid rain and concentrated airborne pollutants like gases, oxidants and harmful chemicals that are especially common in large cities. When these substances land and collect on your bean bag, and rain or condensation causes it to get wet, they can eat into the fabric like acid. Besides, you’ll find that our bean bags look just as great in your house; they are perfect for your game room, casual den or kids’ bedrooms. Many people who love our bean bags use them in sub-tropical climates and other humid areas. While the bean bags are water-resistant, continual exposure to excessive moisture can lead to unhealthy mold and mildew growth that looks and smells horrible. Once mold infiltrates the fabric, it can become difficult to remove. Nobody likes to sit in moldy bean bags, so if your outdoor space is humid, store them in a dry place when they’re not in use. Be sure that all surfaces of the fabric are completely dry before storing. Although our bean bags are made with the best fade-resistant materials on the market, continuous exposure to the sun for days and weeks can eventually cause fading. Even your car’s paint or your cement patio can’t boast complete immunity from the sun. Direct sunlight causes oxidation and will fade even the best and brightest of colored fabrics and paints. 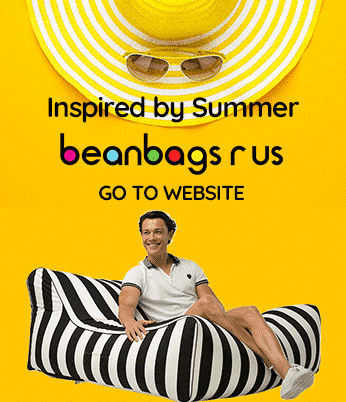 Store bean bags in a shady, dry outdoor area or garage, or simply bring them inside your home. Unless it is one of our pool products, don’t immerse your bean bag in water. Our standard outdoor bean bags are not designed for this use. The chlorine, acid and other chemicals in pool water can quickly fade the vibrant colors. Our covers are made with water-resistant polyester, but if water does infiltrate the cover, it cannot evaporate or escape. Trapped moisture will lead to mold and mildew growth, especially if you are using the product in a humid climate. If your bean bags get wet, remove the inner liner, and turn it inside-out in direct sunlight just long enough to completely eliminate all moisture. Accidents happen, and occasionally your bean bags will get dirty. Use a clean, damp cloth and warm, soapy water to remove outdoor dirt and grime, food spills and other mishaps. An occasional all-over cleaning will help keep your bean bags looking fresh and prevent dirt buildup. Use only diluted mild soap or detergent, and avoid products containing bleach. After cleaning the underside of your bean bags, be sure the surface of the fabric is dry before placing them on the floor, so you don’t accidentally trap moisture underneath and invite mold growth. Unlike our standard outdoor bean bags, our bean bag pool floats are designed to go into the pool with you. Made with heavy-duty Sunbrella marine canvas, they feature a unique drain fabric on one side. This allows you to drain water from the product by standing it upright or on its side. These floats should be drained thoroughly after every use and allowed to dry in fresh air and sunshine. Like our other outdoor products, the pool bean bags can be cleaned with mild detergent and water if they become soiled. If you’re unlucky, and you experience a snowstorm-like bean spill while filling or refilling a bean bag’s contents, don’t panic. Although they are frustrating, it is possible to control the little polyester snowflakes. Avoid using a broom or dustpan; this will just make the situation worse. If the event occurs indoors, use your vacuum cleaner. Clean the vacuum’s dirt reservoir or insert a clean bag, so you can save the beans and reuse them. Hold the nozzle a few centimeters from the floor to avoid picking up dirt along with the beans. If your spill occurs outdoors, use an outdoor vacuum. Avoid using blowers. If beans spill into your pool, turn off the pump, and collect them with a leaf skimmer.